Description: Tuggy Turtle is cute to look at, fun to watch, and pleasing to hear. When pulled, Tuggy swings his chubby legs in a walking motion, he wags his little tail like a puppy, and a merry tune plays from the hidden xylophone under his shell. 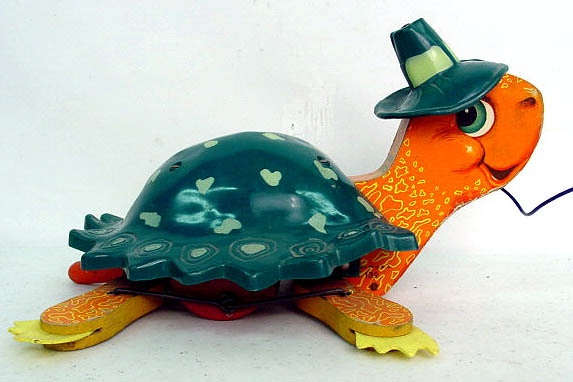 FPT4058 - Turtle with a dark green hard plastic shell that has jagged edges and wearing a dark green plastic hat. The turtle has a wooden cut out head and legs with orange paper lithographs attached. Turtle has large green eyes and yellow spots on his head and legs with yellow plastic "feet" on the end of each leg. When pulled, his 4 legs "walk", his small orange plastic tail wags, and a hidden xylophone plays a tune. Measures 9" long, 5-1/4" high, and 7" wide.